A 44-year-old woman presented to our cardiology clinic for control of her hypertension. She had been otherwise healthy and didn't report any chest pain or dyspnea. Physical examination was normal. An echocardiogram was performed which showed normal function of both ventricles. 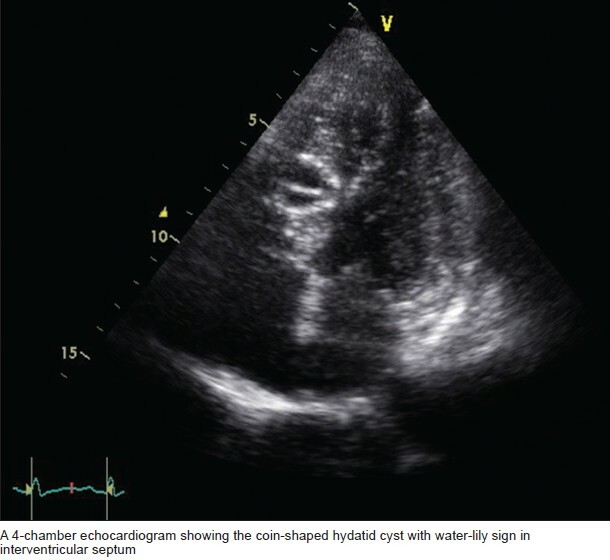 A 2 * 2 cm cystic mass was present in inter ventricular septum with the pathognomonic water-lily sign indicative of detached endocyst membrane and leak of fluid which was compatible with intracardiac hydatidosis. The membrane detachment is unique to hydatidosis. The patient didn't report any history of contact with livestock or pet animals. Blood serology for hydatid cyst was negative. Brain and lung CT scan and abdominal sonography were ordered for evaluation of other organs, which were all normal. The patient was placed on Albendazole and scheduled for surgical resection of the cyst. Pathologic examination was in favor of hydatidosis. Postoperative recovery was uneventful.